In some places mountain scenery is stunted bushes and scree, and what houses exist are, like their occupants, precariously attached to life. Not here. Today I walk up to Shantipura, the highest village in Sri Lanka, sitting on “One Tree Mountain”, named by a monk with an overly literal sense of the oneness of all things. I walk past a white stupa under a pure blue sky. 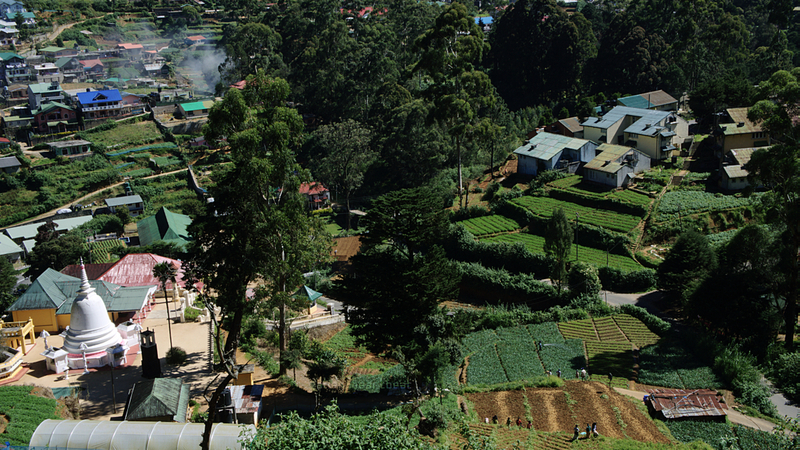 Amid a mass of green, people are digging, planting, watering vegetable plots. Strong women pick tea, their bags held by a band around their heads. They laugh at me and get back to work. Likely they are evaluating and then dismissing me as husband material. The top of the mountain here seems as fertile as the valley. Given over to houses and market gardens growing a dozen different types of vegetable. As I walk around the top I feel Sri Lankans don’t just smile, they laugh hello. Since the end of socialism and civil war, people here grow stuff and laugh. So different from Armenians, who, unable to see their way out from under the oligarchs, are often grim and gray. I get hungry but not much cooked food here. 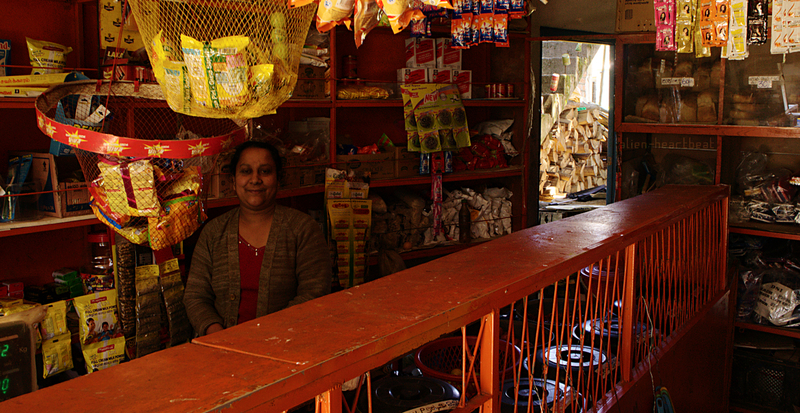 I buy some sugary bread from this woman, who has a nice shop and seems content enough with her shop and with life. 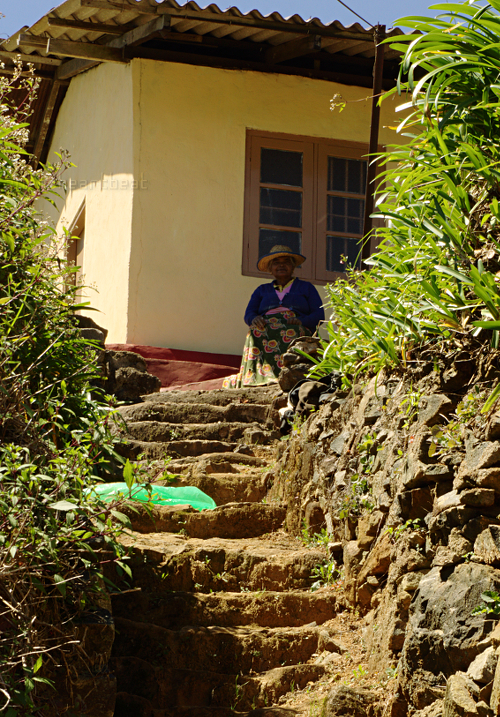 I liked the look of this old woman, sitting Buddha-like on the step. She smiled at me so I took her picture. Later I realized she really was from the old Sri Lanka, and must have been smiling because she heard rather than saw me. When I examined the full resolution picture, I realized she was blind. By late evening I get back down to the town. A chaos of Hindi songs, hand-cooked food, cheap goods. Shops beckoning, touts touting. Here it is the primary colors of plenty. Again so different to Armenia, and its quiet gray of scarcity. It is only now that I realize what it was that struck me most about Armenia – the lack of color. And once again I realize you only really understand what you saw when you no longer see it. Wah! about the cataracts. Why you mess up a very happy post with reality of life in places where treatable not treatable? Why, and wah!!! Yes, maybe you are right. I had been thinking of it more as something that used to be more common but now happens much less. I will think about re-expressing it. Am walkng the next few days without laptop so may take a while. Well as we say in Jamaica, “Walk good” (translates to Godspeed, kind of). No, no, you don’t have to rewrite on my account! I’m just saying it was a very lovely, happy piece and then, wham! no, I agreed with you, that hadn’t been my intent.. So that night I just made it a bit clearer. This is great, I think…the color, and your decriptions make the photos move in meaningful ways…how strange about Armenian monotone. I went back and looked at your posts from there and they are indeed gray…beautiful grays, but…gray. Does the land make the people or the other way round? i don’t know. i noticed the grayness of the pictures on the first Armenian post, which stood beside the last Madagascar post. but i didn’t make the connection to the pessimism of the people until the new Sri Lankan posts. then it hit me. colourful fertile land – happy people. gray land, gray, even dark people. This is a good question. In Jamaica, we have such a beautiful place. So much of it, the mountains and the coast on the island, remind me of my current home, California’s Bay Area. But the feel here is different and the people here are different. In the Bay Area one can afford to not see the things that Alien Hearbeat sees (like blindness that could’ve been avoided). 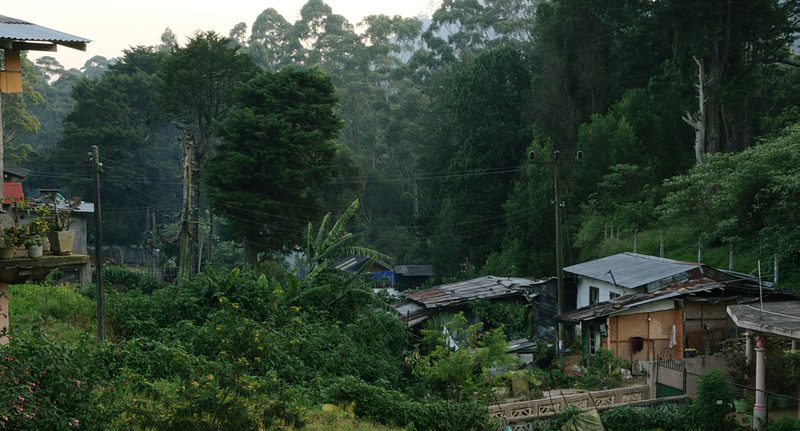 In Jamaica, like in Sri Lanka, there is much poverty and much affluence. The land is outrageously gorgeous and the spirit of the people amazing. I would like to think that it is the relation of the people to the place that makes it so.